Nobody wants to have to pronounce trigeminal autonomic cephalalgias(TAC) let alone suffer from one. In this article, we will make 3 important connections between what the TACs are and actionable items you can do about the connections we make. They are extreme and the only therapies commonly talked about are medications because they are so extreme. Some like hemicrania continua are known as suicide headaches because of their unrelenting nature. But we need to look deeper and understand what is going on here if we want long-term health. We will explain how these make the difference between your body having to create pain or being able to heal as we go along. These are all very different and everything always depends on the individual experiencing the symptoms far more than the actual label you put on it. If you want a deeper understanding of the trigeminal autonomic cephalalgias, see this slideshow. Oxidative stress has been proposed as an interconnecting link between all types of triggers of head pain because of the recently found TRPA1 receptor that takes oxidative stress and transmits it to the brain into neurogenic inflammation. What this means is that oxidative stress becomes inflammation in the brain and inflammation in the brain is bad news. Oxidative stress in and of itself is a basic form of stress. The problem is that this electron can be very violent and if it comes into contact with body tissue such as brain cells it will steal the electron from them, causing damage. This happens every second in our bodies as a natural process and our body has anti-oxidants to protect us and stop this from causing damage. Then these create huge amounts of oxidative stress. In a healthy person that eats well, moves well, sleeps well and follows the foundation principles, this is but a blip on the radar. And if this source of stress is constant and chronic, it creates a huge amount of oxidation and this depletes our antioxidant reserves. Without an antioxidant defense, the oxidative particles floating around our brains and bodies steal electrons and damage tissues until we develop huge problems. We have to prevent this and stop it at its roots. See our articles on the one common connection behind all migraines here and the foundation principles here. Next, we need to understand how inflammation plays a part both in the brain causing problems and overload but also in the body that then gets transmitted to the brain and causes the brain to “dump” out onto nerves like the trigeminal nerve. Inflammation in the brain can come from too many sources to list here because it’s such a primal “fix” that our body uses for everything. Basically, if something goes wrong, inflammation will come. A little inflammation is good but having it chronically all the time is bad news for our tissues. What we can actionably do for brain inflammation is strengthen our blood-brain barrier and prevent leaky gut, give our brain cells the building blocks they need to create energy and run their systems of repair and regeneration and remove the stressors that cause our brains problems. Strengthening the blood-brain barrier has been studied to be done by stimulating the vagus nerve through cold showers, getting ample good quality sleep and avoiding alcohol and EMFs. Preventing leaky gut means we are eating foods that feed the good gut bacteria and avoiding inflammatory and sensitive foods that can create damage or immune reactions in the gut. Giving our brain cells the building blocks is no simple task when we dive into nutritional pathways but when we turn it into something practical we can do daily with whole foods it becomes much easier. Vegetables and meat will satisfy the majority of our nutritional needs but we can boost that with some seasonal fruit, nuts, and seeds. Try to eat all of the colors of the rainbow as each color contains different nutrients. When eating meat remember to not just eat muscle meats as organ meats have far more nutrition and we need to include bones, tendons, and ligaments in our diets because they provide a punch of minerals and get delivered directly into our own tissues. Our body can get lazy and slow if we don’t continually ask more from it. This means exercise, proper stretching, stimulating the vagus nerve and breathing exercises are absolutely necessary to make our body try harder to raise our threshold. Now let’s understand the two branches of our nervous system that function without our direct control and how we can directly influence them to drain our brain or heal the pain. There are two systems in our autonomic(think automatic) nervous systems. There is the sympathetic nervous system which is built on a response to danger. When we are chased by a tiger, going through a divorce or at risk of losing our jobs, our sympathetic nervous system turns on. This system spikes our cortisol and adrenaline causing us to receive a bunch of energy and sugar gets dumped into our blood to be used as energy for our muscles because our body thinks we are dying. This activation of the sympathetic nervous system is known as fight or flight mode. Our body is ready to either fight the danger or run away from it(flight). Our sleep hormones being shut off because during danger we don’t need sleep. The body prioritizes living right now and getting out of danger as opposed to focusing on the long-term. ie. rest and digestion. This system is absolutely necessary and crucial to our survival but it burns a lot of resources and sends our body’s sync with natural rhythms that regulate every single one of our cells out of whack. Then we have our parasympathetic nervous system. This is known as the rest and digest system. It runs our day to day healing and repair and prepares us for things like digesting food, by secreting digestive juices. It protects us from infections, colds, and flues as well as setting our hormones up so that when the sun sets, sleep hormones are up and stress hormones are down, giving us a good nights sleep. Our parasympathetic nervous system is the main healing system we want to be in the majority of the time so that our body is free to repair and digest without being stopped by stress hormones. But everything we do, think, say, feel and believe influences our body into more of a sympathetic or parasympathetic state. These systems constantly switch between each other throughout the day, we just want to avoid getting stuck in sympathetic and luckily for us, when we can feel our bodies, we can consciously bring ourselves out of it with tools like breathing techniques, progressive muscular relaxation, mindfulness etc. If we did something we think our God punishes, we will be in sympathetic fight or flight mode. If we are worried about making money, we will be in sympathetic fight or flight mode. If we have just been told by the doctor that we have an incurable disease and are stuck on medications for the rest of our life, we will be in sympathetic mode. And if our body “perceives” that there are more stresses coming into it then it can handle, we will be in sympathetic mode because it thinks we are being attacked. Our body doesn’t know the difference between a tiger or some bills or the hormonal imbalance we have that gets worse every menstrual cycle or even the sugar-rich food we eat that gives us a blood sugar roller coaster. It thinks there is a stress and it activates fight or flight mode. But if we stay in this mode we will not be able to sleep, digest properly, heal properly, maintain our immune system, cool brain inflammation or detoxify waste properly. But we can change the modes, at any point, with our own conscious connection with our bodies. Remember our body has an autopilot and runs itself for the most part. But our mind is the pilot and can take over whenever it needs. So if we are stressing, we need to realize it and drop the stress. Drop out of sympathetic and into parasympathetic. 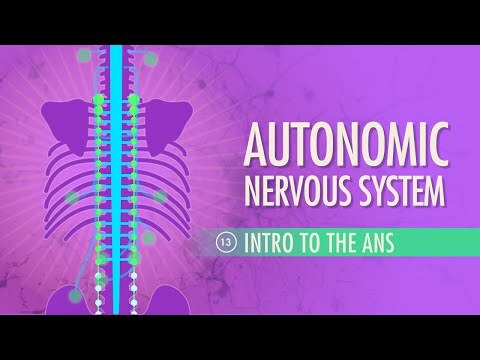 Watch the video below to get an understanding of the parasympathetic and sympathetic nervous systems. And so what we want to understand is that these systems, the parasympathetic and sympathetic are constantly working and balancing each other out. But we have what is called the vagus nerve which is a master nerve and connects our whole body(including organs) together. But this nerve has a 9:1 taking-in information to giving-out information ratio. So it’s always taking in information from our bodies systems and trying to understand what’s going on way more than it is giving out orders. But if we have an issue in a system, let’s say an organ like the liver, our body will send a ton of energy into the liver to try and process what’s going on and resolve it. This feedback that the vagus nerve gets can become too much and it will actually end up “dumping” any excess energy into our other nerves. This is where the trigeminal nerve comes in. The TACs are trigeminal-autonomic-cephalalgias. This means that are regulated by the autonomic system, think parasympathetic/sympathetic and they affect the trigeminal nerve. So what we can experience with these TACs is that the brain is actually dumping extra energy into this trigeminal nerve. This dump, if big enough can create a huge amount of pain and problems. But the actual source of the extra energy can come from anywhere in the chain, from the brain down to our feet because the body is always taking in information and giving out energy to fix it. Which is why doctors often call it idiopathic or primary headaches because there doesn’t seem to be anything wrong with the trigeminal nerve. The limbic system dumps neurological energy into the masseter and temporalis (muscles of mastication). Any aberrant drives returning via the vagus (which has a 9:1 afferent:efferent ratio) will be dumped into the masseter and other muscles of mastication via the trigeminal. Over-activity of the brain-stem spilling into the trigeminal nerve (often from excessive afferent vagal drives associated with gut inflammation) or limbic-emotional stress. So what clues do we look for? We need to look at the whole person and understand that whole body health is the goal, not just avoiding, numbing or removing the trigeminal nerve or associated symptoms. But there are a few key areas to focus on once you’ve received a full holistic(whole body) assessment from a holistic health practitioner. Dental health is crucial and this means having someone discover if we have infections in our gums, under our teeth and especially within any dental work we’ve had done as this is one of the most common culprits. The way dental work is done there is a very high risk of developing bacterial infections under the material and this will leach into the bloodstream and cause a massive strain on the body but also a huge overload right into the trigeminal nerve. You will want to find a move advanced dentist than a standard one. If you’ve had lots of dental work or dental pain then make sure to find a biological dentist that you work well with. Emotional stress is one of the biggest triggers and contributors to all kinds of head pain and chronic disease. To address emotional stress it’s often important we go back in time to our childhoods and discover where we learned to respond to stress the way we do today. Getting overwhelmed about life’s stressors doesn’t serve us and only contributes to more brain fog and problems. But we need to take the jump and crack open the parts of ourselves that we have protected and shielded because they could be holding the tension that keeps us from living healthy fulfilling lives. But this can be difficult especially if we have trauma so this is why it’s important to talk to skilled trauma release therapists and professionals who can help you learn to respond to stress instead of just reacting to it. Upper cervical health and especially atlas vertebrae health is a huge part of releasing the tension our body can create if we have a problem in this area and seeing an upper cervical trained chiropractor can do wonders. Here is a link to a study that found chiropractic bring relief for some trigeminal neuralgia patients. Here is the link to find a NUCCA chiropractor who uses gentle movements and specifically deals with the atlas vertebrae which is a major cause of body pain and dysfunction. And then there is organ health. This is huge and could not be covered in a blog and maybe even in a book but we need to understand there is a connection between our organs, the health of the rest of our body, and the pain in our heads. We need to be willing to find the right practitioners that can help us make sense of this and not settle for the opinions of just the first line of medical healthcare providers like doctors, neurologists, and headache specialists. So many patients are rewarded with health when they ask the right questions and find someone who can help them create answers to those questions, not just dead ends with medications. This is why it’s important to see someone who will give you a full mind/body assessment which is what your GP was originally intended to do but the insurance-based model of medicine has cut down their time to do so. Instead, see a local naturopath or functional medicine practitioner in your area or join the Migraine Professional care plan. To get a deeper understanding of head pain conditions than you’ve ever had before and get to the root of what’s creating issues join the Migraine Professional Community here. See our article on one of the TACs called hemicrania continua and learn 5 profound clues for chronic paroxysmal hemicrania continua here. Have you ever experienced any of the TACs? If so, let me know below what worked for you and what your experience was like. Remember to share this post with others to help those in need by clicking the social media links.